Need some helpful tools or some insightful tips? Check these out. Want to attend a book signing? Check out the dates. All of us are impacted by change. Time seems to have accelerated and yesterday’s impossible goals appear simple in light of the complex challenges we face now. Leaders I talk with each day have, at the least, learned to live with uncertainty, and at best, have found a source of authentic optimism. Yet every leader must keep others engaged in a creative and positive approach to each day, despite nearly constant transition and an ambiguous future. 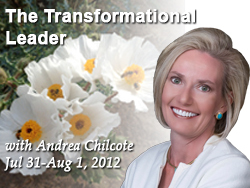 Transformational leaders know themselves, walk their talk, and genuinely care about the well-being of those around them. They inspire and engage creativity and bring out the best others have within – their peak potential. They help people navigate uncertainty by being a stable force in a wild business world. 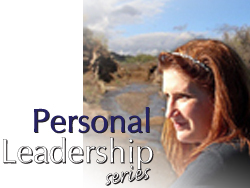 Andrea’s popular personal leadership series.